How about this new Stromberg linkage for the OTB Sling Shot intake? 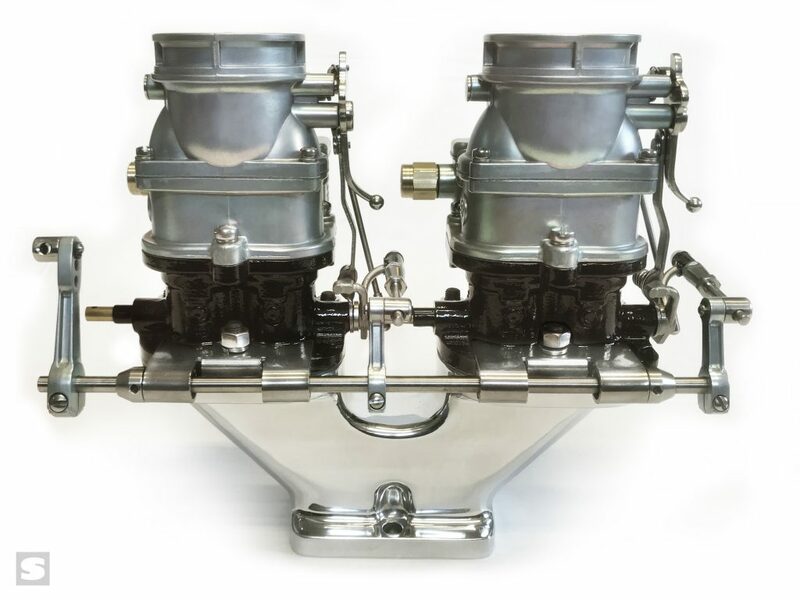 Or any other crazy 2×2 side-by-side carburetor application come to that – like the Frenzel flathead supercharger. In fact we have supplied a couple of made-to-order kits for those. But this is an off-the-shelf kit that will accommodate spacing of up to 6-11/16in. Kit 9263-D. Unique low-line stainless steel brackets support the Back-bar shaft at four points for zero flex and positive operation. Oilite self-lubricating bushes and two small washers to take up any height difference in the base castings. Stainless steel Back-bar shaft with two end stops to prevent lateral movement. Two stainless steel links from the Back-bar levers with Stromberg Linkage Bomb clips (9564K-R) for attachment to the carburetors. One Stromberg 9096K long lever, which can be positioned anywhere along the Back-bar shaft to align with your throttle pedal ‘pull’ point. Complete with swivel and clamping screw. Easy to fit. Supplied part-assembled, with instructions! Want to see the linkage in action? This was an earlier model, but the principle is the same. Twin-plug flathead motor built by Austin Speed Shop and Keith Tardel for our buddy Doc from Louisiana.